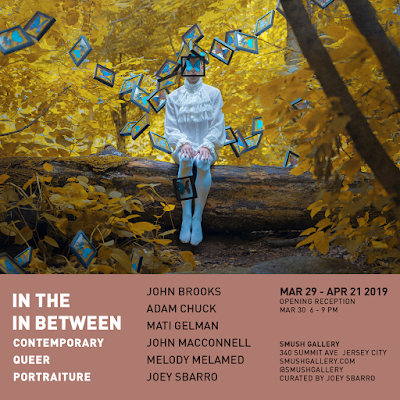 SMUSH Gallery presents an exhibit of paintings, drawings and photographs by John Brooks, Adam Chuck, Mati Gelman, John MacConnell, Melody Melamed, and Joey Sbarro, curated by Joey Sbarro. The artists seek to mitigate the differences between queer people and the outside world by highlighting the desire of every individual for intimacy, connection and aesthetic appreciation. This drive for connection inspired the artists to bring their work together in time and place, in a shared physical location that provides for deeper, more substantial interaction than is possible on their standard social media platforms. In addition to welcoming the public to the opening reception on March 30, the gallery and artists will host an evening of discussion, music, performance, and camaraderie April 13 from 6-10PM. a mix-and-mingle reception from 9:00-10:00pm. Details and tickets will be available at smushgallery.com. All In The In Between events take place at SMUSH Gallery, one of Jersey City’s newest art spaces. SMUSH Gallery hosts creative and community work including visual art, performance, workshops, rentals and professional opportunities for working artists.